Hellboy is going to officiate a wedding early next year, but only if almost every one on Twitter helps out. David Harbour was asked to officiate a wedding by a fan and agreed, but only if the request gets a certain number of retweets. After Stranger Things Season 2 wrapped filming last year, Harbour decided to have some fun with his fans and announced that he would be taking requests for good deeds in exchange for retweets. He officiated a wedding back in January as his Chief Hopper character, took a senior high school picture with a trombone, and even danced with penguins in Antarctica. At the end of September, David Harbour returned to his good deed campaign. The actor revealed that he was up for some more fun, or "nonsense," as he called it, and asked for some more requests. ComingSoon managing editor Spencer Perry asked if the actor would consider officiating his wedding next March as Hellboy. Perry is a big fan of the comics and films, so this would be a pretty big deal. He had this to say. "David, you may remember we met last year on the set of Hellboy (I was the one with the BPRD tattoo that was literally days old). I'm getting married in March to Carly Lane, how many RTs for you to officiate as Hellboy?" 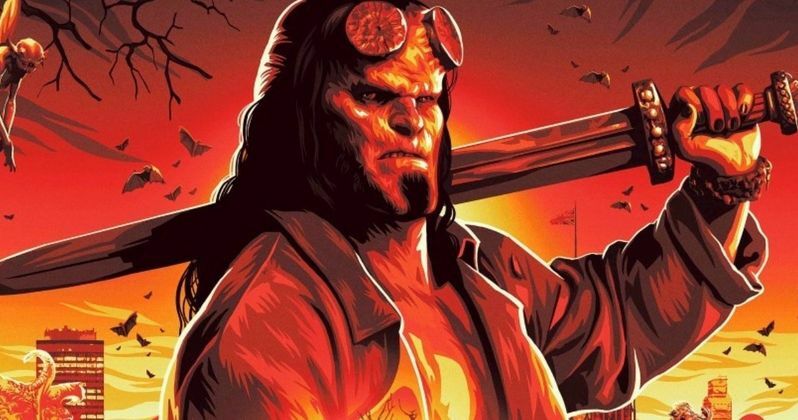 It took David Harbour a little while to respond, but he has agreed to officiate Spencer Perry's wedding as Hellboy if his request gets an appropriate number of retweets for the demonic superhero. This wedding is definitely going to be a lot harder to prepare for than dressing as Chief Hopper from Stranger Things, so it demands a bit more. You can read Harbour's conditions for the Hellboy wedding request below. "666k Of this tweet. Big Red officiates. Full Gear. In his saintly best. Impossible number? Think of how difficult it will be for me to get this character ordained by a Christian church (P.S. - I'll knock off 500k if you can get Mike Mignola to read a poem at the service)." After learning of David Harbour's new request, Hellboy creator Mike Mignola immediately jumped in and agreed to read the poem. However, there's a catch with that as well. Mignola will read the poem only if Harbour writes it. That's not too big of a deal, but it knocks 500,000 retweets off of the request, which is huge. As of this writing, Spencer Perry's request is only at 2,301 retweets and needs all the help it can get. Hellboy could be officiating a wedding with creator Mike Mignola on board, if everything goes according to plan. Let's hope that Spencer Perry can get all of those retweets that he needs to make his dream a reality. Also, let's hope that his fiancé is into the idea since it just came one giant step closer to actually happening. You can read the tweet that started it all below, thanks to David Harbour's Twitter account. Gearing up to wrap season 3. Will have lil time for more nonsense. Who’s got a retweet challenge to close out 2018?